I consider myself a sport scientist who coaches. 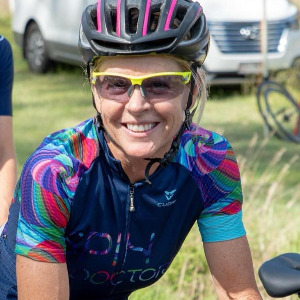 I have been coaching both triathlon and cycling for 25 years throughout my career as a sport scientist in Australia, the UK and South Africa. I specialise in athletes that seek accountability in their training and value one on one interaction on a timely basis. I feedback on all sessions daily and encourage athletes to communicate with me as much as possible. I particularly enjoy coaching age group and masters level female athletes. I have been coaching Triathlon since 1993 when I did my Level 1 coaching course for triathlon in Canberra at the AIS where I was employed as a sport scientist. I did the inaugural Level 2 Triathlon coaching course conducted by Triathlon Australia in 1997. I was a selector for Triathlon Australia for a number of years in the late 1990s, including for the Sydney Olympic Games. From 2000 until 2004 I was the High Performance Manager for Triathlon South Africa, including attendance at the 2001 World Championships in Edmonton, Canada and 2002 Manchester Commonwealth Games. I have been coaching cycling since I returned to Australia in 2004, and renewed my Level 1 coaching accreditation in 2014. My approach to coaching both cycling and triathlon is a scientific one. My PhD is in sport science after all. Having said that, there is an art and a science to coaching; and understanding your athlete is a very important part of coaching. So it is definitely not all about numbers. The way I coach creates accountability, and I understand that this does not work for all athletes. I work with you as an athlete to develop a training program that is manageable within the boundaries of your lifestyle. It is my job to get adaptation in your performance with the hours you have available to train. For this reason my programs are quite dynamic. I feedback on every session daily and am constantly tweaking sessions to ensure maximum gains for the least amount of training time. Success. Coach Deborah Latouf has been notified of your message.